This week's featured article comes with a warning - for cauliflower content! 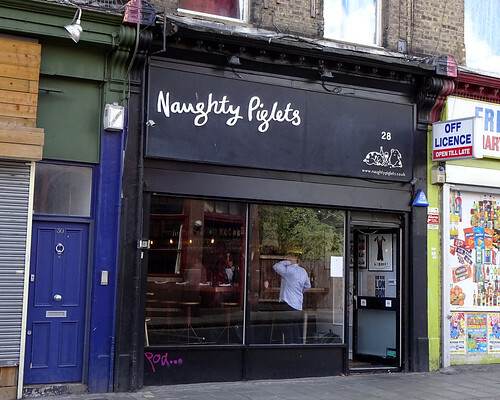 Thankfully at Brixton's Naughty Piglets there are other non-hideous foodstuffs available. Ham! Cod! Hazelnuts! Not all at once though. (A ham-cod-hazelnut combo would still be preferable to cauliflower). Our list of vegan-only establishments continues to expand with a new page for Thenga Cafe in Bloomsbury, where you can try a coconut milk masala tea. There's also vegan food available at the Brookmill pub in Deptford, including the always-mysterious vegan mayonnaise. How do they manage it? We will never know (i.e. I don't want to know). A little further eastward are two pub updates, following a visit to Greenwich: I remember the Pilot having a pleasantly spacious beer garden, but perhaps skip their eggs florentine if you're having breakfast; you might be better off with a scotch egg at the Cutty Sark, which would go nicely with a pint of Young's Ordinary, and depending on the weather, a picturesque view across the river. Finally, the Bull & Last is closed for a refurb. Hopefully this will include eradicating all traces of cauliflower from the premises.